You waited, didn’t you? You’ve been waiting to start your new ideas and goals until tomorrow. We say we’re going to wait until the clock starts over, and until then, we’re going to live our old indecent and undesirable ways. It’s like our own personal Mardi Gras every day, sowing our wild oats one last day or week until we have to make better decisions. But isn’t that a terrible way to live? I am so thankful for new days, new weeks, new months and New Years. I believe that starting over mentally and chronologically hits a true reset button. In fact, even sleeping can reset us in measurable ways. However, believing that we need to wait for a new year or new month to start something new is a huge waste of time. Isn’t it arbitrary anyway? Each of us has a lot more to offer the world then living mediocre versions of ourselves until some cosmic starting over. We don’t need a new year to start over. We can start over tomorrow, but it would be even better if we started over today. So what if you realize you want to make a change on a Wednesday in April – make the change. 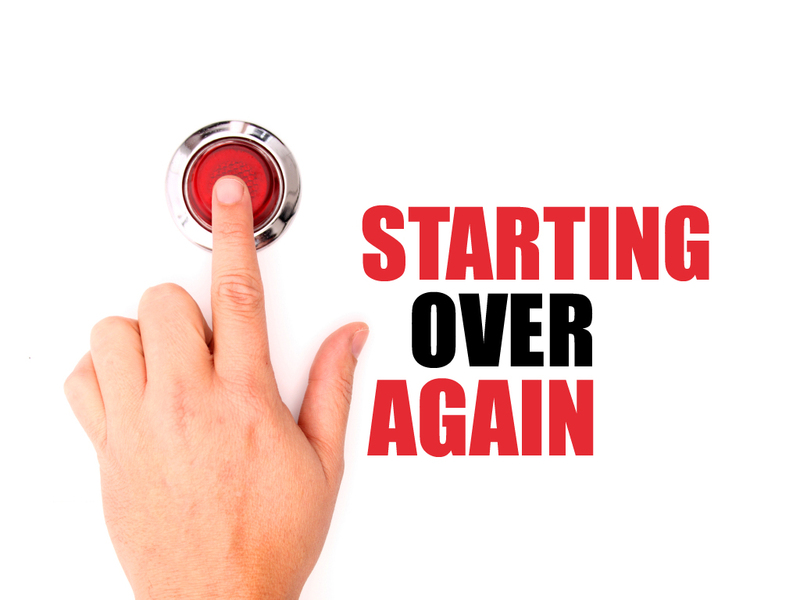 Starting over can happen any time of day, morning, noon or night. The time doesn’t matter – commitment to the change does. Don’t buy the hype that you need an federally recognized holiday to start over. This thinking will cause unnecessary anxiety as you remain in a place of mediocrity you’ve already outgrown. It’s like trying to cram yourself back into pants that fit you in high school. The old behaviors and ways of thinking don’t fit anymore, but you’re still trying to live in them. It’s uncomfortable and ingenuine, isn’t it? Want to make change that lasts? Here’s a quick guide. Decide what you want to change, create a plan, set up accountablity, then follow through. You don’t need a new year or a new day for that. Here’s to big changes we keep, and here’s to new, even though we don’t really need it. I agree! If it takes a number (like 1/1) for you to get on track, great! If not, even better! So true. Having an easy date like 1/1 can landmark change more easily for us, but at the end of the day, we can start over whenever we need to. It’s a gift of our humanity. Are You Addicted To New?